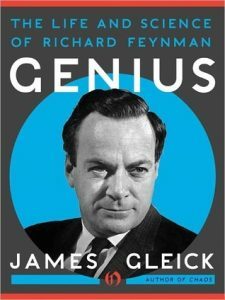 Genius: The Life and Science of Richard Feynman by James Gleick | Blah! These days, celebrities come in the form of musicians, actors, sometimes politicians, and athletes. They draw lots of attention and, in many cases, lots of money. They impact our lives, creating the music and films we listen to and watch, the sporting feats that entertain us, and, in particular, the policies that govern our lives. However, conspicuously missing in this list are scientists. Arguably, scientists make more profound and lasting changes that have greater impact on our lives, providing the fundamental discoveries and insights that become the technologies that transform our world, our way of work, and even how we are entertained. But, they don’t become celebreties. They are not widely recognized in society. Most of us would be hard pressed to name more than a few scientists, and most of them are known more for their advocacy than their actual science. Think Neil deGrasse Tyson. Or Stephen Hawking. How many more can most of us think of? Maybe one of the last great scientists that also captivated the imagination of society as a whole was Richard Feynman. Even so, I didn’t know about him as a kid, even as I got into science and was going down a path that ultimately led to a career in science. In my case, I think my first exposure was Feynman’s role on the panel investigating the destruction of the Challenger space shuttle. But, even then, I didn’t know anything about his science. It wasn’t until later, when I actually began studying physics in earnest, that I started learning something about Feynman’s science and life. That was through his two semi-autobiographical books: Surely You’re Joking, Mr. Feynman! and What Do You Care What Other People Think?. These are more anecdotes of his life rather than detailed accounts of his science, and as such they contributed greatly to his celebrity. He was one of the most respected scientists in the world, but he was also a character, a man full of life, full of stories that let people see a side that wasn’t just the science, a side they could relate to. I admit that I still don’t know much about Feynman’s science. I went a different direction in physics and his work always felt over my head. I did take one of the volumes of his Lectures on Physics with me when I lived in Spain for a year, hoping to delve more deeply into my studies, but I got distracted by the bar scene in San Sebastian. Of course, I encountered Feynman again in graduate school, but only briefly as my own studies agin took me in a different path. That said, reading James Gleick’s biography of Feynman, Genius, let me “connect” with the mystique and science of Feynman in a way I hadn’t done before. Gleick intermixes Feynman’s personal life with the scientific advances he was making, including describing the struggles that any scientist encounters to some degree when they are embarking on pushing the frontiers of what is known. At times, Feynman struggled to find a topic that inspired him and, at others, struggled to push that science forward at the pace he really wanted to. At least later in life, Feynman had the luxury, due to his past success, to take his time to work at his pace and on problems of profound interest to him. He didn’t have to worry about the modern “publish or perish” paradigm that stifles so many. It makes me wonder how Feynman would have done in today’s environment. Gleick does describe many of the profound contributions Feynman made to science, though admittedly they still go over my head. I would hope that if I had the time to devote to understanding his work, I might be able to, but the way Gleick describes how Feynman was able to make his leaps of insight and how he saw the fundamental nature of the universe, one can’t help but feel that Feynman was simply one of those people who truly is a genius, someone who’s mind works in either a different or faster way that allows him to see things others simply cannot see. Even for a non-scientist, I think this biography would be an excellent read, one that conveys the excitement of scientific discovery as well as the hard work that is involved. It also captures that spark that we are all born with and we all have as kids — that spark that causes us to ask questions about the world around us, that spark that many of us seem to loose as we grow older. Gleick captures that spark in Feynman and the fact that he never lost it, he never stopped asking those questions. Feynman also challenged those around him. He would ask provocative questions, such as If all scientific knowledge were lost in a cataclysm, what single statement would preserve the most information for the next generation of creatures? Feynman’s answer to this question was: “All things are made of atoms — little particles that move around in perpetual motion, attracting each other when they are a little distance apart, but repelling upon being squeezed into one another.” It is essentially these interactions that form the foundation of my own research, how atoms interact to form materials and how those materials respond when the atoms are disrupted. As Feynman described it, science is not an absolute. “The scientist has a lot of experience with ignorance and doubt and uncertainty… we take it for granted that it is perfectly consistent to be unsure — that it is possible to live and not know. But I don’t know whether everyone realizes that this is true.” He contrasted this doubt with the certainty that is often characteristic of religious beliefs. Science doesn’t provide certainty, it provides a framework in which to interrogate the nature of the universe. In the end, this is a great book about a fascinating man and his remarkable contributions to science. Getting a glimpse of how a very human person who also had one of the greatest scientific minds approached his work and found his way to these great insights is both fascinating and humbling. It certainly wants me to learn more about other great scientists.